5 Best Jura Coffee Machines Reviews – Which is Right for You? As anyone who has looked into buying a new coffee machine will tell you, the range of options available can a little overwhelming. If you want a brewer that makes a top brew with the minimum of effort on your part, a Jura could be ideal – so here are our best Jura coffee machine reviews. 3. 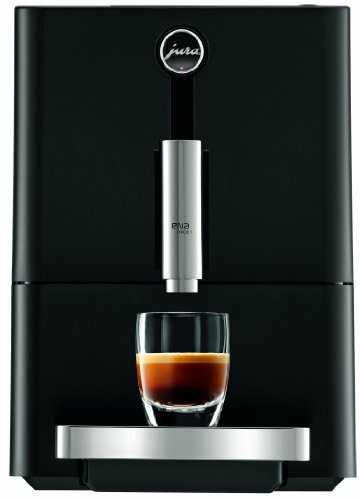 Jura A1 Ultra Compact Coffee Center 15148 with P.E.P. Let’s start by saying a few words about the company that makes these machines. Jura was founded in 1931 in Switzerland and has been a major player in the high-end home appliance market since the 1980s. The company prides itself on the traditional Swiss values of innovation, precision, quality, reliability, sustainability, and service. Jura only produces premium automatic specialty coffee machines, and by focusing on only one type of product, the company ensures that it excels in what it does. With a Jura, you can expect a machine of extremely high quality and stylish design that is capable of producing an excellent cup of coffee with a minimum of fuss – you choose the drink and the brewer does the rest. If you prefer a machine that allows for more hands-on control over the brewing process, one of these automatic-style machines might be less suitable. Although Jura only makes coffee machines, both for home and professional use, they still offer a wide range of models and choosing can be a little difficult. Here are some of the features to look out for. 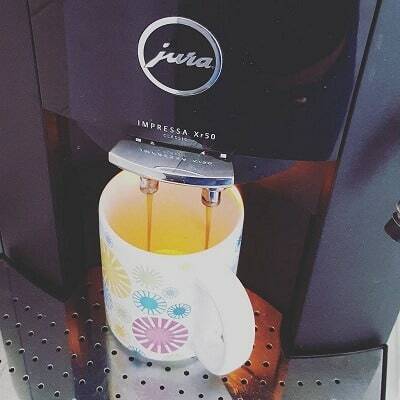 All Jura machines are designed for ease of use. While each machine is different, the controls are invariably uncluttered and intuitive to use. Jura’s advanced Pulse Extraction Process helps to ensure that coffee is fully and evenly extracted but in less time than other comparable machines. Jura machines contain special foaming technology that double-froths the milk, resulting in a smooth and silky foam for your espresso-based drinks. Most machines include an adjustable spout, making it easier to use varying sizes of mug. Jura machines are all-in-one automatic machines, which means the grinder is incorporated into the design. You just add beans and the machine grinds them for you. Causes the coffee to be pre-infused, creating a “bloom” before the main cycle begins. This helps ensure a perfect, uniform extraction, resulting in an even better cup of coffee. Jura machines can be adjusted to pour varying sizes of beverage. Jura machines feature an “aroma” setting – in fact, this allows you to choose how finely the coffee is ground and so control the intensity of your drink. Staying true to the company’s philosophy of being ecologically-aware, Jura machines include energy-saving technology to help protect the environment. Thermoblock technology ensures that water reaches the correct temperature efficiently and then is kept at that temperature for brewing, ensuring a superior cup. Some models incorporate a bypass doser, allowing you to brew using coffee other than that stored in the hopper. This is ideal if you need to make a single serving of decaf, for example. Here are our top five picks for Jura coffee machines. This machine measures 16.1” x 11” x 13.6” and weighs 22lbs. It is a compact unit that would fit into smaller kitchens without taking up too much space, while its sleek and stylish design would bring an element of understated class to any room. As you would expect with any Jura machine, this brewer takes ease of use to a new level. The controls are simple and uncluttered, with only the rotary switch needed to change between drink types. It features a height-adjustable spout which can be set to between 2.6” and 4.4”, allowing you to use different sized cups and mugs without any accidents. 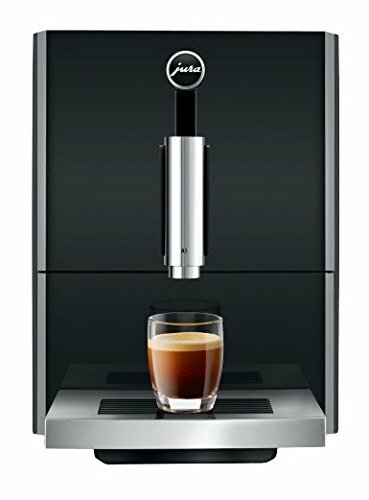 In line with other Jura brewers, this machine includes fine foam technology, meaning you can produce a rich, silky foam for making cappuccinos, lattes and all your other favorite espresso-based drinks just like in your local coffee shop. Other features include a hot water capability for when you don’t want to make coffee, adjustable drink strength and brewing under 15 bar of pressure for authentic, delicious coffee shop-style espresso. We love the way this machine offers high-end performance in such a small package. We also like the minimalist design and ease of use, making this brewer an ideal choice for someone who cares about drinking excellent coffee but doesn’t necessarily want to waste time making it. This machine measures 9.1” x 12.7” x 17.5” and weighs 19.4lbs. It has much in common with the Impressa C65, but as can probably be guessed from the “Micro” tag, this machine is designed to offer the power to brew superior coffee in the smallest unit possible. As with the C65, it is extremely easy to use, with a minimum of controls and buttons, giving you only what you need to select and brew the coffee you want and nothing more. This machine features a multi-level grinder and allows you to program in three user-defined pre-set coffee cup sizes and two “aroma” preferences – here, as in other Jura machines, “aroma” is used to mean intensity. Other than the two pre-sets you choose, other strength options are also available. This is a machine that has been designed with the environment in mind – as well as your electricity bill. The energy saving setting will help make sure you don’t use up more power than you need, the auto-off setting serves a similar purpose – and the machine is particularly efficient anyway, all of which will help bring your electricity bills down. 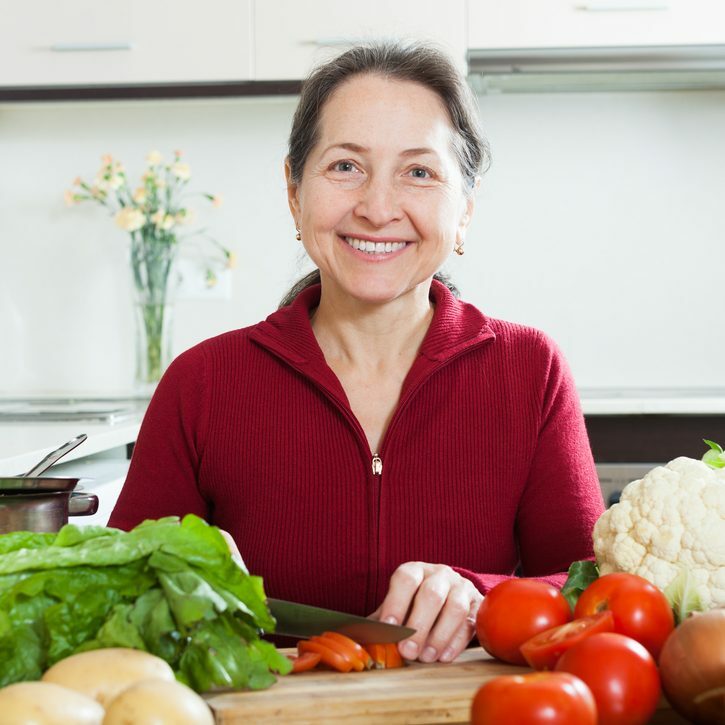 You may also like: What is the Best Time to Drink Coffee in a Day? For us, this is an outstanding machine if you are looking for a high-powered espresso machine with a small footprint. It will bring a touch of style to your kitchen without taking up too much space. This machine measures 20.5” x 12.7” x 18.6” and weighs 26.6lbs. It is sold as “Ultra Compact” but is, in fact, larger and heavier than both of the coffee makers reviewed above. It is available in two colors, black or white. The A1 is a classic Jura machine and boasts all of the features you would expect. The design is understated and stylish, making this a unit that is likely to enhance any kitchen or interior space. The controls are clear and easy to understand, making it a good option for even the most confirmed technophobe. You can also choose between two levels of coffee strength, giving you a certain amount of control over the coffee you brew. The Thermoblock technology along with brewing pressure of 15 bar ensure you can use this machine to consistently produce high-quality coffee shop-style drinks. The P.E.P. technology carries out a pre-infusion sequence, allowing the coffee to bloom, further enhancing the flavor. We particularly like the visible bean container that allows you to see how much coffee is left in the hopper. There is also a self-cleaning reminder that lets you know after every 180 servings that you need to run a maintenance sequence. 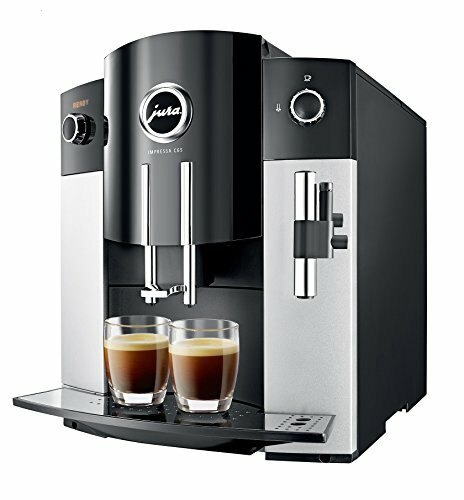 This is a slightly larger machine than the previous two, but it is at the lower end of the price range for Jura machines. 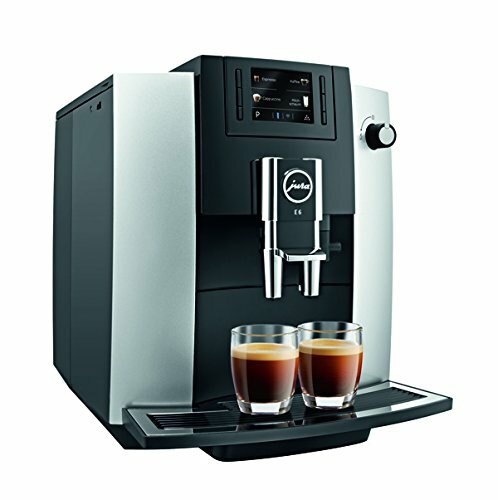 It could be a good pick for someone who wants a high-end coffee machine without necessarily wanting to break the bank. This coffee machine has dimensions of 17.3” x 11” x 13.8” and weighs in at 22lbs. This means it is not considerably larger than some of the other machines in this review, but as a model in Jura’s E Line range, it offers some significant upgrades in terms of performance and adjustability. It is pre-programmed to brew six different classic coffee drinks including espressos, double espressos and cappuccinos. It also gives you the option of choosing between eight different strength settings, meaning you have much more control over your coffee with this machine. The controls are simple and intuitive, as with other models; the E6 features Thin Film Transistor (T.F.T.) controls, which are ergonomic and pleasant to use. This machine also includes P.E.P. extraction technology, producing coffee with a fuller, richer bouquet. It incorporates a fast, quiet G3 grinder, which is designed to produce up to 60% less wasted coffee, it features an adjustable spout and it also boasts advanced hygiene features to make sure your coffee is clean, fresh and bacteria-free. This is a great option for someone who is looking for a machine with all the qualities you would expect from Jura but with a little extra functionality – and who doesn’t mind paying a bit extra to have it. Measuring 20” x 17” x 13”, weighing 40lbs and packed with extra features, the Giga 5, a professional-grade coffee maker for the home, is the Rolls Royce of the Jura collection. Everything about this machine seems to push towards perfection. The near wear-free double ceramic grinders grind the coffee to the utmost precision before it is brewed into one of the 12 pre-set specialties – including several innovative options not available on other machines. The dual spout can be adjusted from 2.75” to 6.25”, offering the maximum of flexibility when you choose which cup to use. 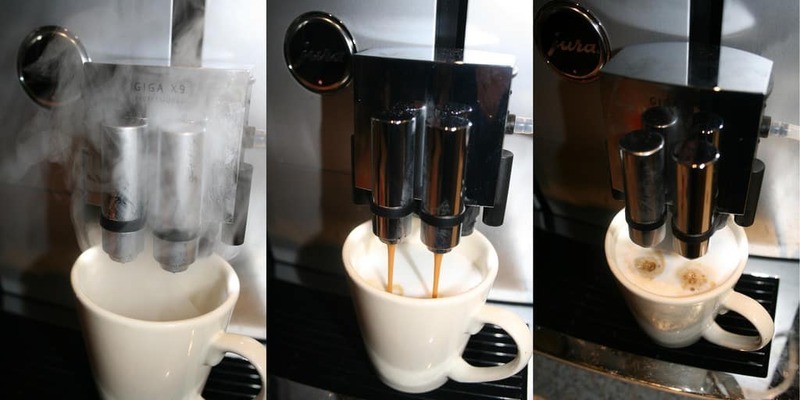 When making espresso-based drinks with milk and foam, the machine does all the work, dispensing first hot milk, then foam and finally coffee, leaving you with no work to do – you only need to select the drink and the brewer does the rest. In short, this machine is designed for anyone who wants a professional-quality machine to make outstanding coffee in the comfort of their home. It must be remembered that this machine sells at a significantly higher price point than the other machines in this review, but if you are considering brewers in this category, then this is probably not going to be a problem. As we mentioned earlier, Jura is a company that prides itself on its engineering and production values. 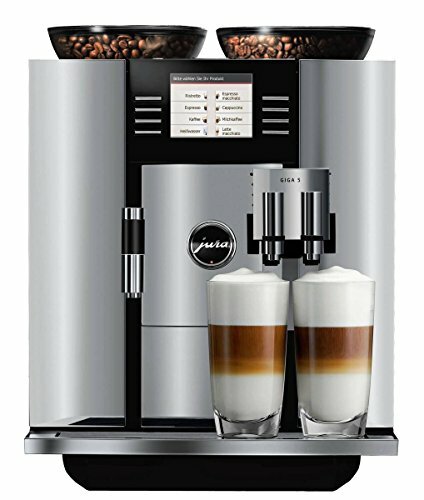 Any one of these machines, whether a less expensive entry-level machine or the top-end Giga 5, would be a good choice for a reliable machine that will produce great coffee for many years.